Nere has never understood why she feels so much more comfortable and confident in water than on land, but everything falls into place when Nere learns that she is one of a group of kids who-unbeknownst to them-have been genetically altered to survive in the ocean. These products of "The Neptune Project" will be able to build a better future under the sea, safe from the barren country's famine, wars, and harsh laws. But there are some very big problems: no one asked Nere if she "wanted "to be a science experiment, the other Neptune kids aren't exactly the friendliest bunch, and in order to reach the safe haven of the Neptune colony, Nere and her fellow mutates must swim through hundreds of miles of dangerous waters, relying only on their wits, dolphins, and each other to evade terrifying undersea creatures and a government that will stop at nothing to capture the Neptune kids...dead or alive. 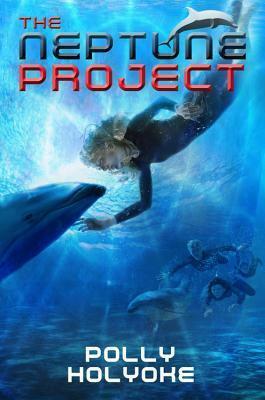 Here is a dystopian novel with a neat underwater twist. Nere and her mother, Gillian, live in a world almost destroyed by global warming and under the thumb of a totalitarian government, the Western Collective. Still, Nere can concentrate on her passion for dolphins (with whom she can telepathically communicate) until the ax falls. First, the government decides to move the residents of her area away from the sea. Then, Nere learns that she has been part of the Neptune Project. Gillian has altered Nere's genes so that she can be one of the first humans to live entirely underwater. With relocation imminent, Nere is given an injection that finishes her transformation. But no one has taken into account Nere's wishes. Feeling betrayed, Nere isn't sure that she wants to participate, nor does she want to swim across the sea to join the rest of the colony. Although the writing is pedestrian, the adventure element is a real draw. That Nere can experience regular kid situations throughout all of this-friend issues, parental problems-makes the story relatable, even if her best pals are (totally terrific) dolphins.- Ilene Cooper Booklist Online"
Polly Holyoke grew up in Colorado, where she spent her childhood skiing, camping, reading, and dreaming up fantastical stories. Polly went on to graduate from Middlebury College and become a middle school social studies teacher. She lives in Plano, Texas with her husband and their two daughters, as well as two cats, two Chihuahuas, and a Beagle.